Coming into college, firstyears worry about a lot of different things — getting along with roommates, difficult course loads and homesickness. But for me, as a student with food allergies and intolerances, eating safely was my number one concern. My first experience with the UC Santa Cruz dining halls was during my three-day orientation in the summer of 2014. They had placed us in the dorms of Porter College for the length of the stay and lead us to the Porter/Kresge Dining Hall three times a day for our meals. On the first day, I met with a dining hall manager to explain my food allergies, but by the second night I was having difficulty breathing and breaking out in hives. I had to skip a lot of the activities because I was ill. I came to UCSC with a severe allergy to wheat and with celiac disease, an autoimmune disease that makes it unsafe for me to digest gluten. Throughout my first year, I attempted to eat at the dining hall a number of times because I was living on campus and I didn’t want to waste the money I had spent on my meal plan. However, many of these visits were harmful. A 55 meal plan on campus, the cheapest option available, costs $623 per quarter and students living on campus, whether they have food allergies or not, are required to purchase a meal plan. This leaves students with allergies less money to purchase safer foods they can make themselves. Toward the end of my freshman year, I was hospitalized after accidentally consuming a wheat noodle mixed into a wheat-free dish at the dining hall. A friend took me to the hospital and I missed two days of my classes. Though signs are used in dining halls to tell consumers which foods are free of common allergens, dining hall employees go through minimal training on separating allergens in the kitchen. When hired, employees are given a PowerPoint presentation explaining what a food allergy or a food intolerance is, what the symptoms are for someone who is having an allergic reaction and the dangers of cross contamination between different food items. And while managers attempt to separate allergens during the meal preparation process by working with them in different parts of the kitchen, there is little that can be done to regulate cross contamination because of contact with serving utensils, food spills, gloves or other tools. Labels marking the absence of food allergens in a meal often discount traces of allergens and this can lead to extreme allergic reactions. Even for me and others who think they are being really careful, eating at the dining hall puts your trust, and health, in others’ hands. So how could I safely navigate dining hall food? The first step for me was to contact the Disability Resource Center (DRC) to make a plan for eating and housing. The DRC then encouraged me and other students to reach out to the manager of the dining hall we frequented most. 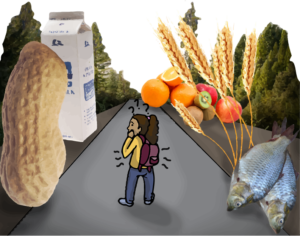 Students are also encouraged to meet with dietitian Nancy Jackson at the Student Health Center, where they will go over which foods can be harmful to an individual with food allergies and how to read food labels to check for food allergens. Though everyone throughout this process was very kind and helpful, I still became sick multiple times on campus. I was lucky enough to be able to switch over to cooking my own meals exclusively because I lived in the Kresge College Apartments, but for many this is not an option. UCSC needs to do more to ensure students can eat safely where they live by increasing training for all dining employees and providing incoming students who have food allergies with information on who they can talk to — rather than misleading them with allergen-free labels and not making clear the dangers of a shared kitchen. Many students on campus do not have the option of cooking their own meals so it is the obligation of the university to provide them with a safe opportunity to eat.